Windscribe has created one of the simplest VPN interfaces out there. Yet, this tool is capable of handling almost all of your VPN needs. Windscribe prides itself on offering users a host of ways to connect to the internet. Whether it’s through your browser, your router or your phone, Windscribe provides a solution that helps you access the content you need while keeping you safe on the internet. To do this, the company has a network of roughly 534 servers in 100 cities across 52 countries. In fact, this is a point of pride for the company since, as Windscribe points out, that some VPN companies fake their servers with false IP WHOIS data. Windscribe, however, is pleased to offer physical servers in those countries. Keeping you safe from prying eyes is what the company is all about. Its desktop application employs an AES-256 encryption protocol and a 4096-bit RSA key while browser extensions utilize the TLS 1.2, ECDHE_RSA with P-256 key exchange and AES_128_GCM cipher security. Its desktop applications also support forward secrecy. Windscribe has also made efforts to bypass government censorship in countries like China, their Stealth protocol having been created exactly for this purpose. However, if users still have difficulties, the company will work with you to manually configure an IP through their API Resolution tool. Windscribe states that they don't keep logs of any internet traffic on activity. In fact, all of your session data is deleted within three minutes of you disconnecting. However, with the company operating out of Ontario, Canada, users may want to consider risks to their privacy as the Canada is one of 5/9/14 Eyes countries. Windscribe produced varied results when tested. Throughout the day, we tested Windscribe using their “Best Connection” setting and a variety of websites. In most instances, the connection time was indistinguishable from that of our ISP. However, at times the connection seemed to hang and there existed a bit of a delay when opening a web page. 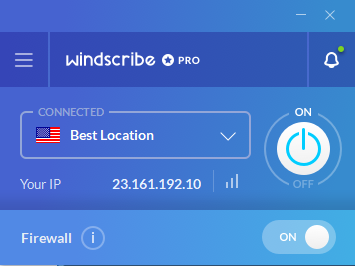 Initially, we had some trouble attempting to use Windscribe VPN since its built-in firewall is set to the default “ON” position. However, after a much-needed update, this discrepancy seemed to evaporate. Ping times had greatly improved and pages loaded without too much delay. If you want to stream the US Netflix shows than you will need a premium membership to connect with the “Windflix” server. Fortunately, download and torrenting speeds also seemed to remain consistent with or without VPN use. Windscribe offers users a number of connection possibilities. As mentioned before, there are over 53o servers spread out in 50+ countries. For free users, the company offers servers in just 11 countries. The bulk of Windscribe’s servers are reserved for Pro users only. With plenty of servers in the Americas, Europe, Asia, and even a few in Africa, users won’t have a hard time finding a server that’s right for them. Since many individuals living outside the United States use VPNs to gain access to services such as Netflix and Hulu, they will be pleased at the number of servers located in the US. However, our tests produced varied results with Netflix and BBC iPlayer. Netflix worked with Windscribe when connected with the “Windflix” server. We were unable to stream the BBC iPlayer, even when connected to the UK Windflix server. Conversely, Spotify seemed to work without a hitch. 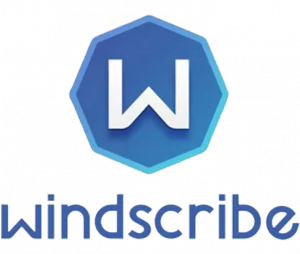 Windscribe gives users the ability to choose the server of their choice. Drilling down on each location reveals a list of available servers with cool, sometimes funny names such as Cheesesteak for Philadelphia and Umbrella for Seattle. This tool can be incredibly helpful if the user wishes to unblock geo-locked content such as sports programming. A new feature that was recently added is port forwarding with a static IP address. Currently, this is available in 10 locations, and you can get a residential static IP address in two locations. Windscribe has a tool for every platform. You can use the software directly on your Windows, Mac or Linux (Ubuntu, Debian, Fedora, CentOS). However, the company also highly recommends using their Google Chrome, Firefox or Opera browser plugins as an extra layer of security. Windscribe can be used directly on your phone, your TV, and even your router. 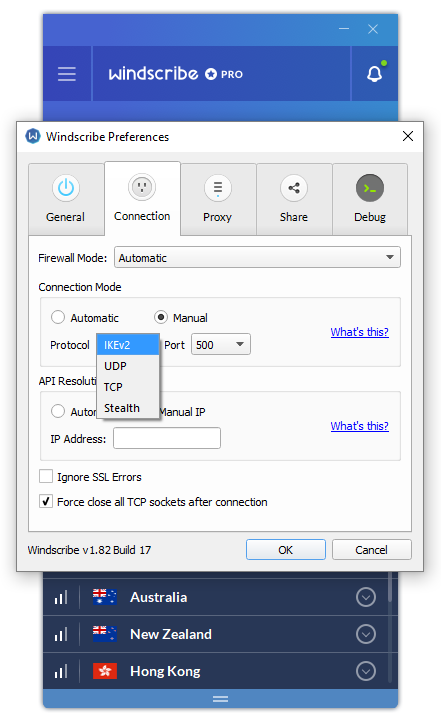 For the adventurous, Windscribe even allows you to setup the software on any device that supports the Open VPN, IKEv2, or SOCKS4 protocols. Windscribe’s interface is simple and incredibly easy to use. Upgrading to the Pro version from the free version was lightning fast. The user interface consists of a small window that displays the server location, your IP address, Firewall toggle switch, a giant On/Off button and a hamburger menu that allows users to adjust preferences, see their account details, and get help, among other options. The default VPN connection is a U.S. server tagged “Best Location”. 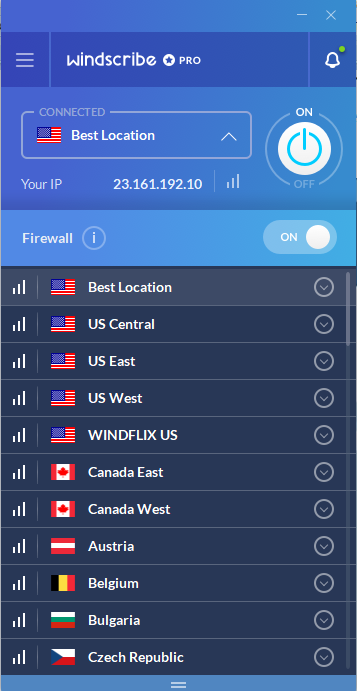 However, clicking the arrow displays all of Windscribe’s locations which are broad regions located in each country. For example, the United States is broken up into US Central, US East and US West, just to name a few and each location is listed along with its ping time. Turning on Windscribe and connecting to a server took about two minutes to complete. Best Location featured a ping of 68 ms and while web pages seemed to open quickly at times, this wasn’t always the case. In addition to this, the connection would sometimes drop and force the software to have to reconnect. Since there is no kill switch feature with Windscribe your internet connection will no longer be secure and you can be vulnerable. Selecting Preferences from the menu and then clicking the Connection tab reveals a number of protocols to choose from. If the Automatic setting isn’t for you, you can switch to Manual and choose between IKEv2, UDP, TCP and Stealth. These options also allow users to specify their own port numbers in case they are blocked from using the default setting. Stealth mode, a TCP protocol via Stunnel, is Windscribe’s fix for those users who are walled in by Chinese censorship. If this isn’t successful, Windscribe even allows users to manually configure an IP through their API Resolution tool. While many of these settings are geared primarily for advanced users, novices will have to seek out more information or speak to a technical team member. Yet, the VPN isn’t all that Windscribe offers. R.O.B.E.R.T is a great addon that detects and blocks malware, tracking cookies, and much more. It's easy to configure, so you can get the protection you need. The company also offers a number of Browser Extension Features to help keep you and your information safe online. Among them, Ad Blocking, Double Hop (gives you the ability to proxy your connection through any two servers on the Windscribe network), and Time zone Spoofing (changes your time zone to that of the server). 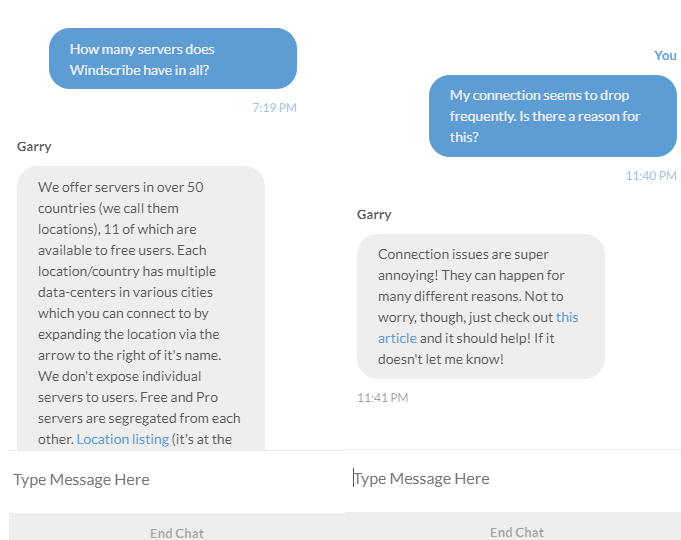 Windscribe has a live chat feature on their site in which users can ask questions about the technical issues they experience. Answers to questions are super quick, but online help is actually a chatbot that searches and serves up the answer to your question. While it’s only a bot, it’s a pretty good one that seems to do a good job answering questions. If the chatbot fails to answer your questions, Windscribe has technical staff on hand to help out. Creating a support ticket submits your request to the staff who will reply when they can. We tested the customer support by asking a question about dropped connections. Unfortunately, 24 hours later, we were still without a response. Windscribe also invites you to join and participate in the Windscribe “subreddit” on reddit.com where users and staff alike discuss the software and help address the issues users are experiencing. Windscribe VPN has both free and paid versions. The free version comes with fewer servers and a 10GB/month bandwidth cap. Free user are invited to earn more bandwidth through various activities such as referring a friend or by mining CryptoCurrency. On the other hand, the paid version offers both unlimited bandwidth and unlimited device connections. In addition to the standard monthly or yearly plans, Windscribe offers a unique "Build a Plan"option. By choosing this option you only pay $1.00 per month per server location. This is a great option if you don't need multiple locations. The Windflix servers are included when using the Biold a Plan option. Windscribe accepts a variety of payment methods. Users can even pay in Bitcoin for added anonymity.